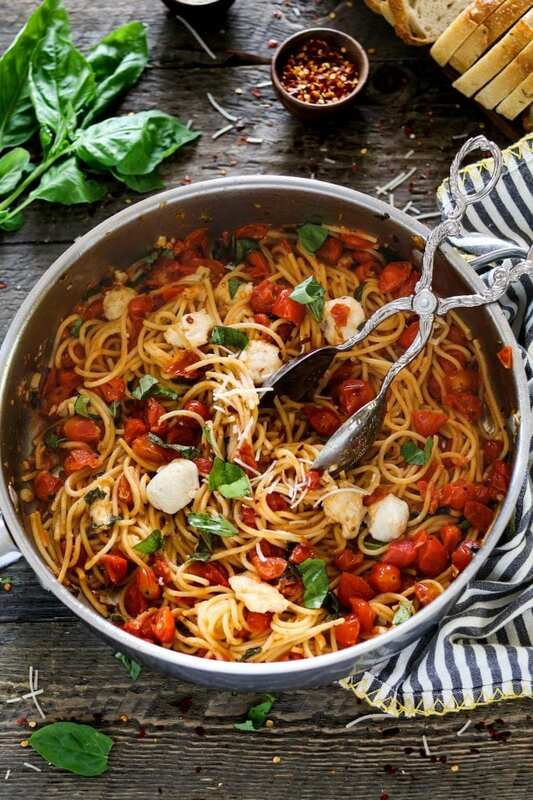 This Vegan Pasta Caprese takes 30 minutes to make and has a fresh taste of summer in every bite. 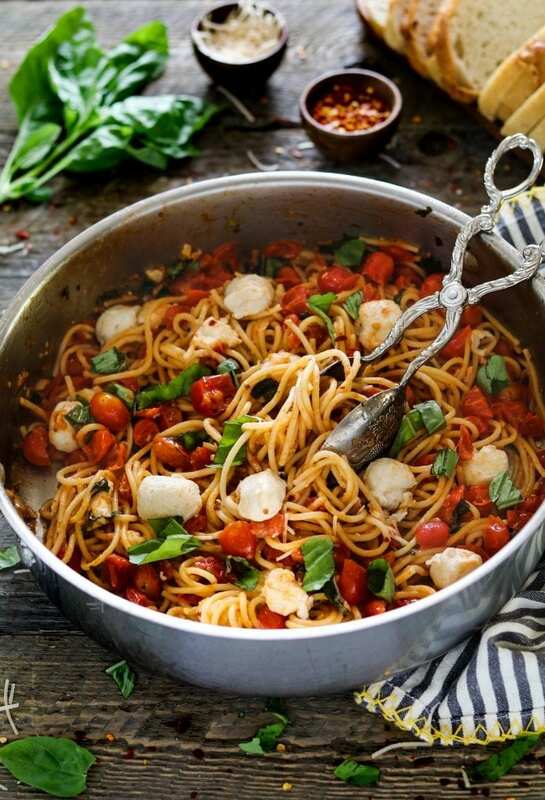 My 4 favorite ingredients: tomato, basil, pasta and vegan mozzarella… all together in one delicious bowl. It’s pure heaven! 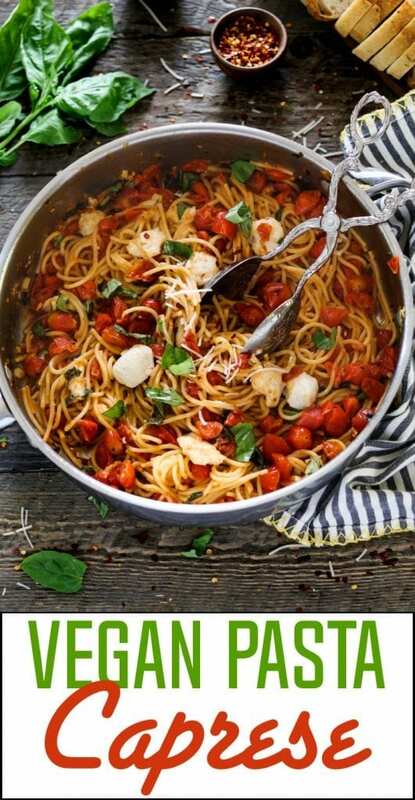 You just can’t go wrong with this Pasta Caprese recipe. It’s packed with zesty fresh flavors that will make your summertime complete. It’s not a secret that I’m a big carb pasta lover. It’s the epitome of comfort food for me. I love super creamy & cheesy pasta dishes like this Mac n Cheese and this Vegan Fettuccine Alfredo, but for warm weather, I love this fresh-tasting Vegan Pasta Caprese dish. Typically this dish calls for a good amount of olive oil, so I wanted to lighten it up a bit. I’ve seen some recipes online that use 1/2 cup of oil, but I don’t think it’s needed. I’m not anti-oil, but less is more sometimes. To moisten things up, I used only 2 tablespoons of olive oil and low-sodium vegetable broth. The broth also adds more savory flavor to this already flavorful meal. It’s a win-win! *note: if you make the vegan mozzarella, it will take longer. I usually have it in my fridge all summer long because it goes with everything. Feel free to use store-bought vegan mozzarella to make life even easier. I’ve also made this dish without any cheese and it was still insanely delicious! That’s it! It’s an easy-peasy summer dish that is worth making, tonight! 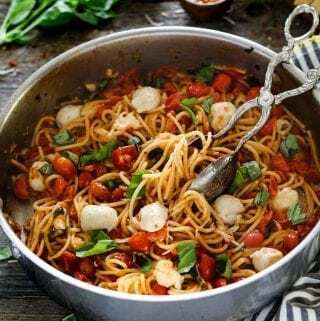 If you make this Pasta Caprese recipe, I’d love to get your feedback. You can leave a comment below and let me know what you think. It would really make my day. You can also follow me on Instagram and share your creation with me. Just tag me @veganhuggs and hashtag #veganhuggs so I don’t miss it. Place spaghetti in a large pot of salted boiling water. Cook until al dente according to package directions (about 10-12 minutes). Drain and drizzle with olive oil to prevent sticking. While the pasta is boiling, heat olive oil in a large skillet over medium heat. Add garlic and crushed red pepper flakes. Sauté for 1-2 minutes. Be careful not to burn the garlic. Add tomatoes, salt, and fresh cracked pepper. Sauté for 4-5 minutes, until tomatoes soften and release their liquid. Add vegetable broth and lemon juice. Bring to a simmer for 2-3 minutes to incorporate flavors. Remove from heat. Add drained pasta and fresh basil. Toss to coat. Taste for seasoning and add more as needed. If things seem a bit dry, drizzle a little olive oil on top or add a few tablespoons of vegetable broth. Add vegan mozzarella and serve immediately. Serve with vegan parmesan on the side. Enjoy! * Mozzarella: You can use store-bought vegan mozzarella shreds. Just make sure you like the taste before adding it to the pasta because it can really change the flavor. I would use about 4 oz, instead of 8 oz (you can always add more). I made mini mozzarella balls by using a measuring spoon (teaspoon). I just scooped out pieces from the larger homemade mozzarella balls (I used about 2). This is not necessary, but it looks nice. If you don't have vegan mozzarella, you can omit it from the recipe. I promise the dish will still be insanely delicious. You can sprinkle on extra vegan parmesan if you have it or nutritional yeast. * Nutritional info includes my homemade mozzarella. * Recipe adapted from Rachael Ray. I made this dish exactly as the directions stated and it was delicious. I did buy a vegan mozz cheese and used nutritional yeast in place of vegan parmesan cheese and that worked just as well. 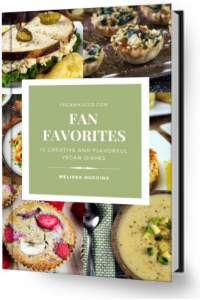 I am not a fan of the vegan mozz you can find in the store so I might just leave that out the next time i make it! I really don’t think that will change the flavor of it. I loved the few recipes I have made so far! This is so delicious I will be make Ng this again! Thanks for the recipe! So simple, so full of flavour???? Not only does this sound delicious, but your photos are amazing!! We eat with our eyes first and you definitely got me drooling! Thank you, Jasmine! I originally planned to shoot them on plates, but the pasta looked good in the pan, so I just went with it. Melissa, this is gorgeous! Perfect for summer, but I would surely eat it all year round! The whole family would love this. What a delicious looking pasta! We love dishes like this in my house. I’m a huge carb love too Melissa! This pasta looks amazing! Something straight out of Italy! Yummy! This is totally my kind of pasta recipe! I love Miyoko’s mozzarella. It’s great when you don’t have time to make your own. The combination of ingredients in this pasta caprese is simply irresistible.